Issue 36: Battle of the Blue & Gray! Now an annual Christmas event, our big holiday issues features extra pages and a ton of toy soldiers for you to peruse. In fact, taking into account the massed battle scenes, this issue shows over 2000 toy soldiers for your holdiay delight! 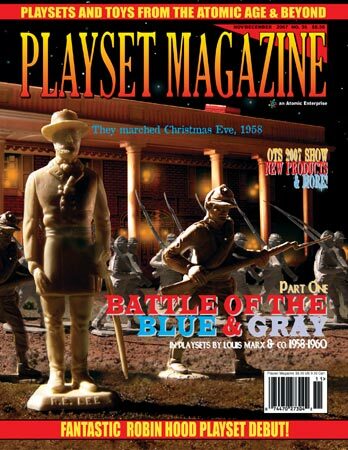 Our cover shows General Robert E. Lee and the Confederacy marching off on Christmas Eve into the hearts of kids throughout the world as Marx debuts it's Battle of the Blue & Gray playsets for 1958. In the background, a Marx mansion is all aglow with the joy of the holidays, but the General knows what is coming and stares into an uncertain future. But we certainly start this Blue & Gray Part One with terrific, detailed coverage of these wonderful playsets, going from the ground up to give you first-time ever complete reports on the contents and origins of one of Marx' most beloved creations. You'll see the troops and accessories in their very specific color groups, correct for year and set. Plus there's some special coverage of lesser-known sets. You may have been reviewing PM Webmaster Jim Clouse's wonderful coverage of this year's recent Old Toy Soldier show in Chicago, and we cap it off with MORE official coverage from America's only plastic-dedicated publication. Then there's the really special coverage of one of the greatest debuts the show has ever witnessed: Ron Barzso's definitive Robin Hood playset with its fantastic add-on castle , a medieval work of art so great it can only be covered here in its publication premiere! We proudly note this was created by Ron with sculptor-in-residence the one and only talented Jim Clouse! Plus there's news of recent finds, auction news, new-stuff capsules, a story about the "100 Soldiers set", The Greatest Playset continues, tons of ads and much more! We also point out that our new DVD "At The Alamo" is hitting the shipping lanes of America's mail system about now. See our special update elsewhere on this website! This all-Alamo DVD is Volume XII in our series of Playset Video Collectors and was shot in Texas, California, Illinois and Colorado and covers the Alamo as told in toys and popular media, and features Fess Parker with special appearances by noted author and historian Frank Thompson and a special appearance by Virginia Shahan, wife of Happy who built John Wayne's Alamo movie set and has preserved it as Alamo Village. There's a tour of Duke's incredible movie set, the Alamo Shrine, many dioramas, a NEW siege segment feature 100's of Marx figures in action, stories about the Disney TV series, fad, all the playsets, and much much more. It's over 1 hr long, has several bonus chapters, and has the licensed Dimitri Tiomkin music score arranged by the incredible Mike Boldt with music available on CD at www.Mikeboldt.com. This one is a must for every collector's shelf and comes in colorful shrink-wrapped case intended for your permanent library and you can get it right here on the PM website.